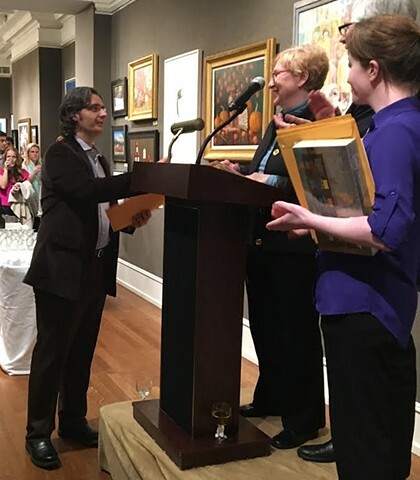 Honored to announce that my painting Swan Song was awarded the Arthur T. Hill Memorial Award last night at the reception for the annual Salmagundi Club Members Show! If you haven't seen it already, be sure to check out this spectacular and truly eclectic show before it ends (runs until the the 18th of this month). 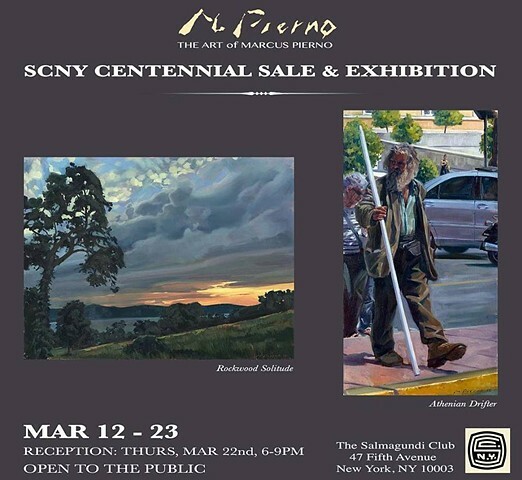 On now until the 23rd: Special Exhibition & Sale at The Salmagundi Club to commemorate the members' art sale that was held in the Spring of 1917 to raise funds for the purchase of 47 5th Ave. A large portion of the proceeds will go the benefit the club. 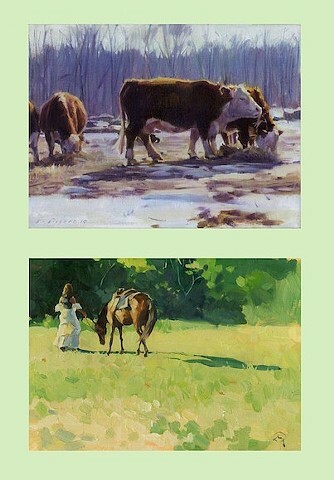 I have two paintings in the exhibit: Rockwood Solitude and Athenian Drifter. The reception on Thursday, March 22nd (6-9PM) will feature live jazz and wine tasting! Check it out. Hamlet VIII The Algonquin Cat on People TV! 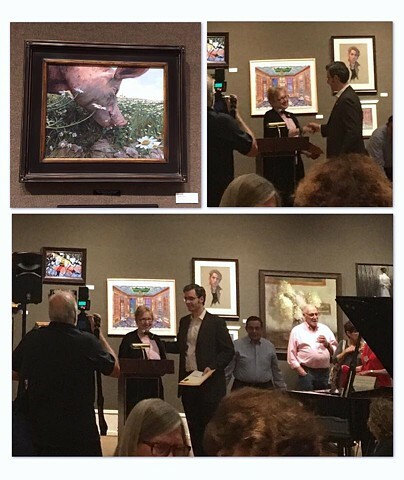 My painting Trash Day picked up a certificate of merit last night at the reception of the Greenwich Village: People, Places, and Things debut exhibit at the Salmagundi Club! I was also happy to learn that this Greenwich Village-themed show might become an annual event! If I had to choose an all-time favorite, most inspiring neighborhood, it would have to be Greenwich Village. 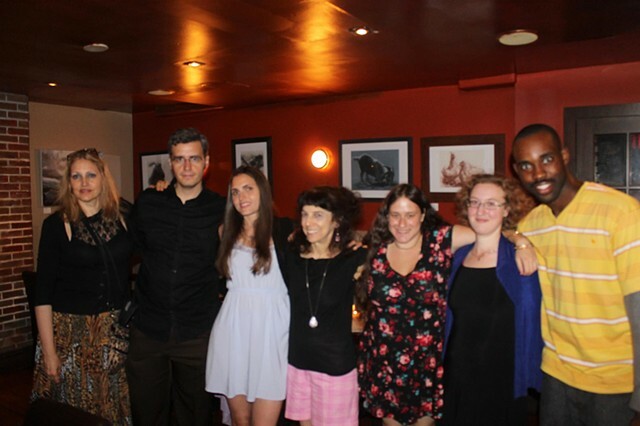 Not to mention it was wonderful meeting everyone from the Greenwich Village Society for Historic Preservation. 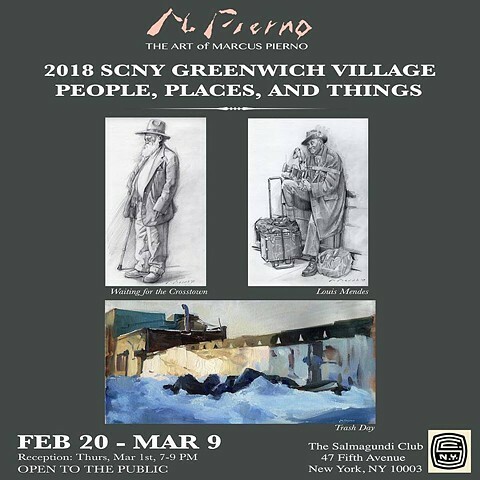 The Salmagundi Club Greenwich Village: People, Places, and Things show starts today and runs until March 9. 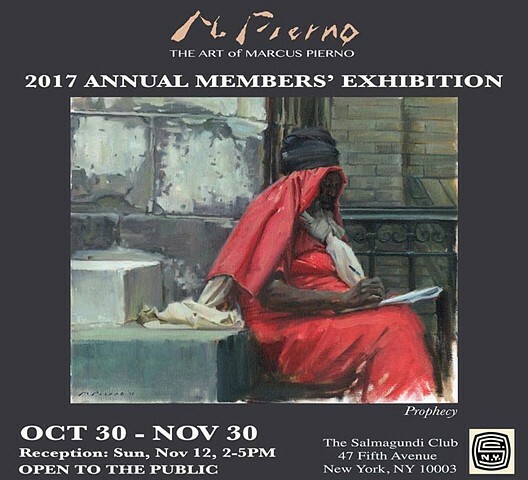 This exhibit celebrates the neighborhood in which The Salmagundi Club has resided for the past 100 years. I have three pieces in the show - two newer drawings (Waiting for the Crosstown/Louis Mendes), and an oldie painting (Trash Day) from 2006. This is sure to be an exciting show - don't miss it! 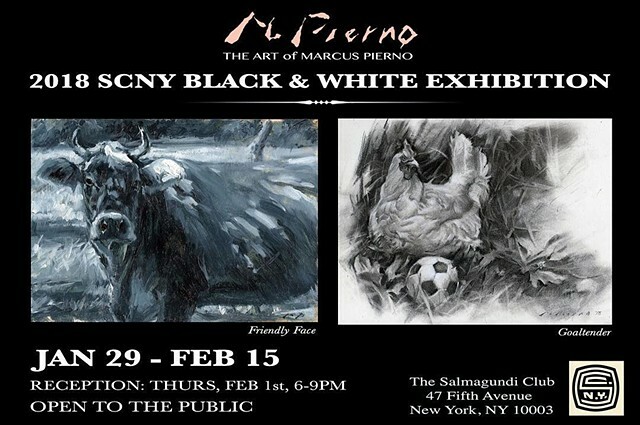 The annual Salmagundi Club Black & White exhibition starts today and runs until Feb 15! My painting Friendly Face and drawing Goaltender are in the show. This all-media exhibition in the upper galley will include only black and white or sepia monochromatic works. Come by and check it out! 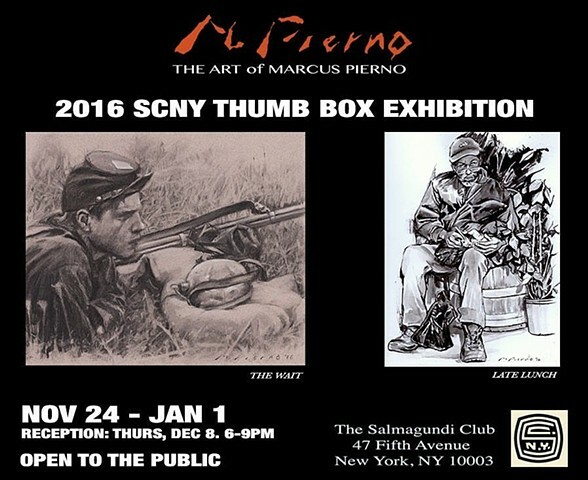 The annual Salmagundi Club Members' Exhibition is on now and runs until Nov 30th! The show includes my painting "Prophecy". This month the club is also celebrating its Centennial on 5th Avenue - visit www.salmagundi.org for event information. Don't miss it! 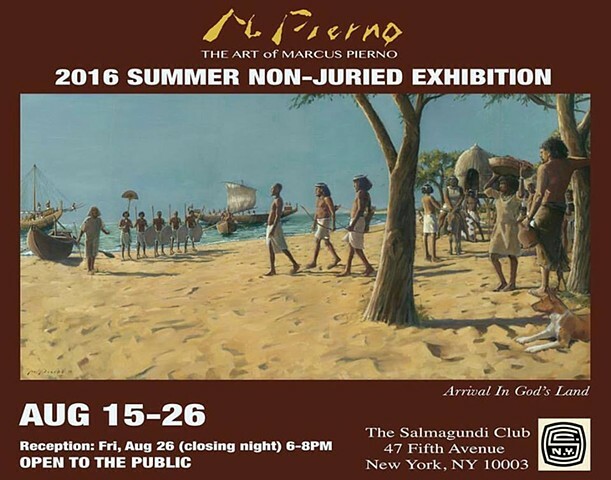 Had a wonderful time last night at the reception for the spectacular Salmagundi Club Summer Show. My painting A Better World won the Henry Nordhausen Memorial Award. 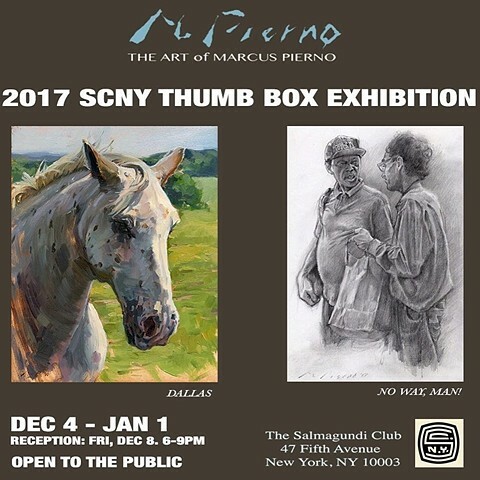 The annual Salmagundi Club Summer Exhibition is right around the corner! It starts on Aug 14th and runs until Aug 25th. The show will include A Better World, a painting from my Sanctuary Animals Series depicting a pig grazing for chamomile flowers at Farm Sanctuary. Don't miss it! Standing next to Algonquin Hotel Executive Assistant Alice De Almeida during last night's fantastic event and fundraiser for The Mayor's Alliance for NYC's Animals. 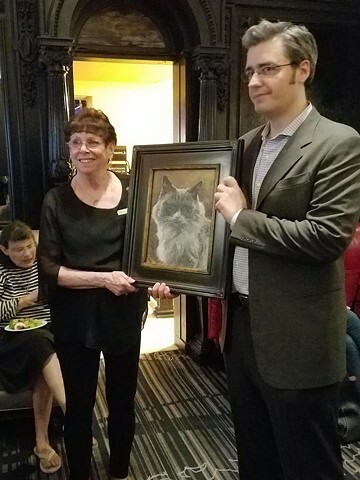 Matilda III is now retired and Hamlet has taken over as the new Algonquin cat, but the portrait I presented was in tribute of Matilda's 7 years at the hotel. 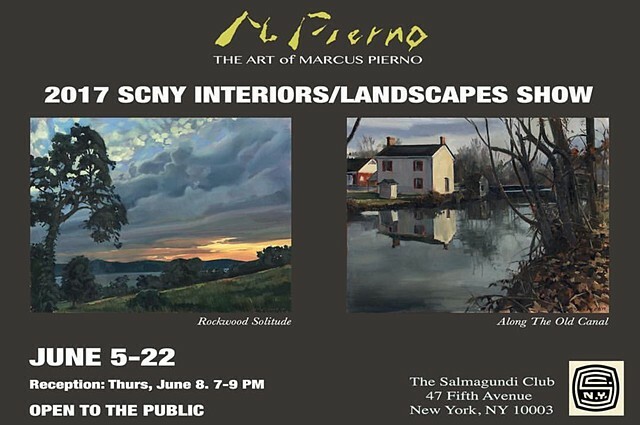 The Landscapes/Interiors exhibition at Salmagundi Club starts today and runs until the 22nd. Reception is on Thursday. Proud to be part of this amazing show - Don't miss it! 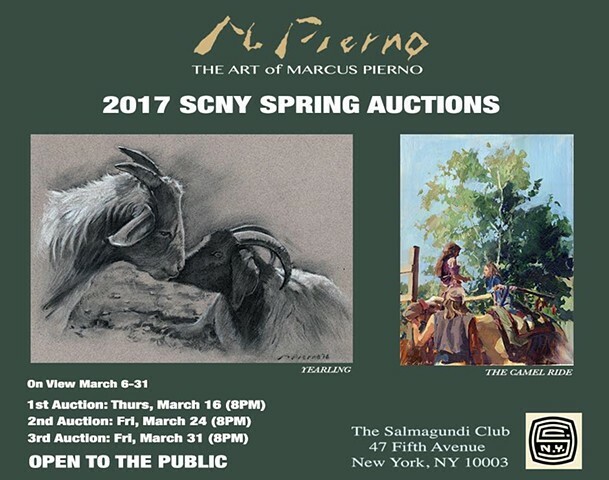 I'm pleased to announce that my artworks "Yearling" and "The Camel Ride" have been accepted into the Salmagundi Club Spring Auction cycle. Viewing starts today and lasts until the end of the month. Mark your calendar! The auctions are a lot of fun, there are complimentary refreshments, and you could potentially walk home with an original work of art. 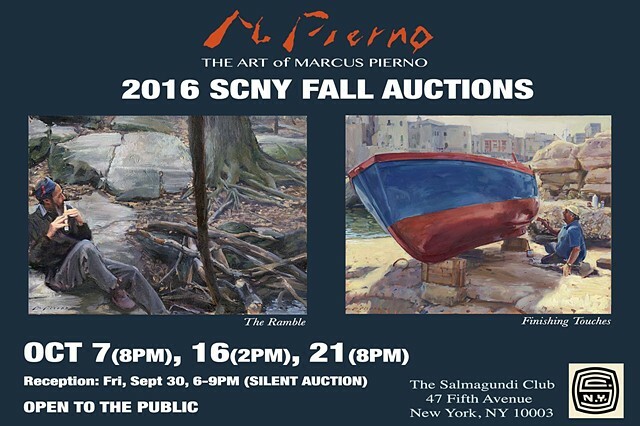 Visit www.salmagundi.org for more information on absentee bidding, etc. 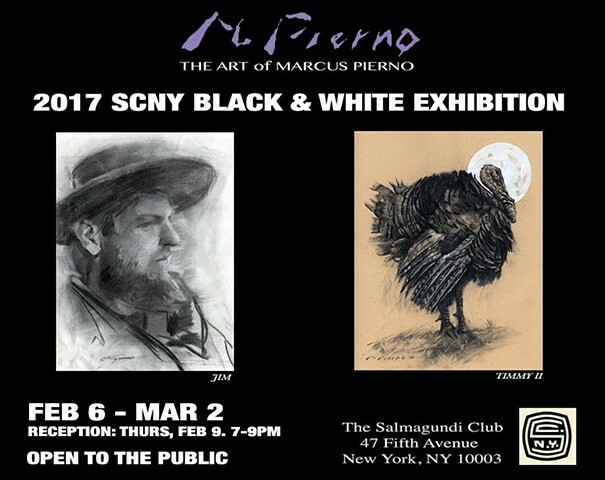 The annual Salmagundi Club Black & White exhibition is right around the corner! My drawings Jim and Timmy II will be in the show. This all-media exhibition in the upper galley will include only black and white or sepia monochromatic works. Come by and check it out! Runs until early March. 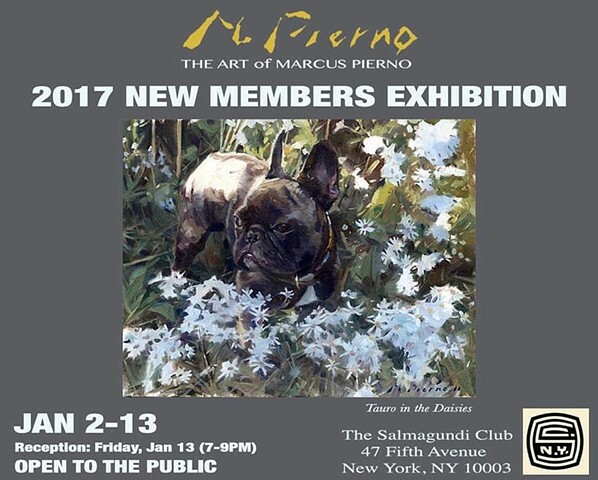 The 2017 New Members Exhibition at The Salmagundi Club starts today! Come see my painting Tauro in the Daisies, along with other works from new members of the club. The show runs until the 13th. Open to the public. 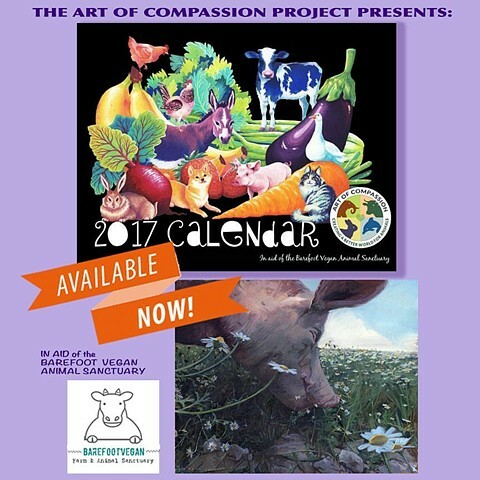 My copy of The 2017 Art of Compassion Vegan Art Calendar (in aid of The Barefoot Vegan Animal Sanctuary), which includes my painting A Better World, just arrived in the mail. 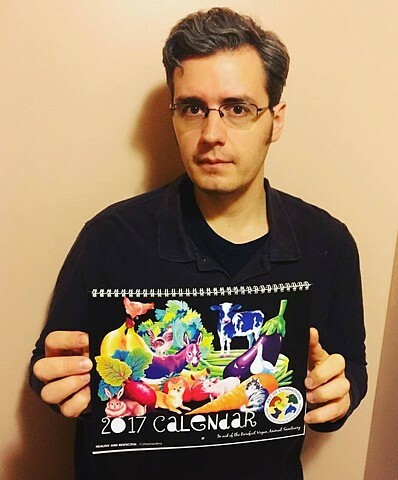 The calendar is beautifully printed and looks spectacular! I'm proud to be part of such an amazing group of artists. Order yours today HERE . 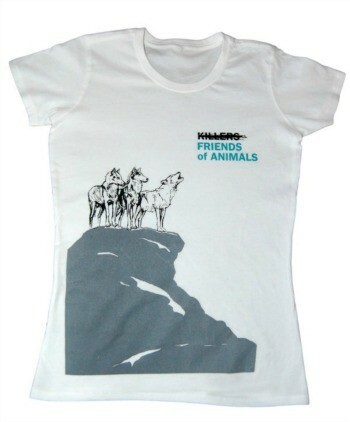 Makes a perfect gift and you'll be supporting a great cause for the animals! 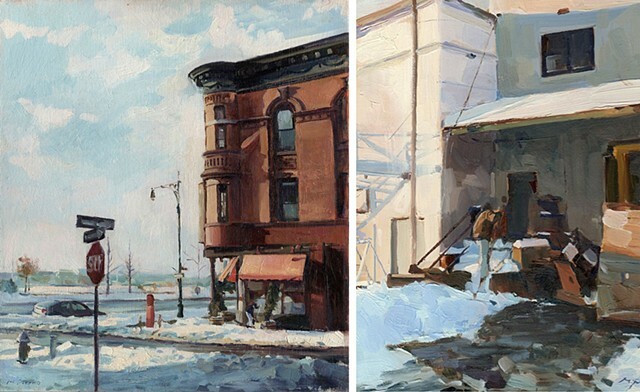 Annual Salmagundi Club small works exhibition and sale is right around the corner! My drawings The Wait and Late Lunch will be in the show. Runs until the end of the year--A great opportunity to do some holiday shopping for that unique, one-of-a-kind gift of original art! Mark your calendar! 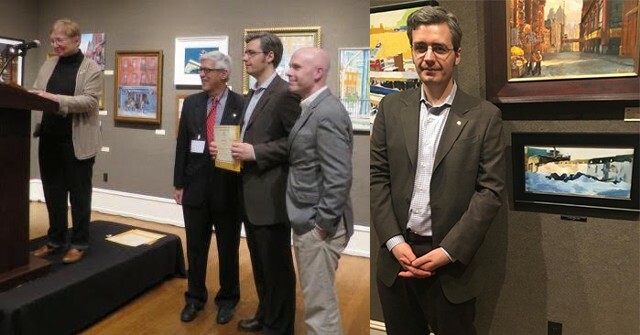 Two of my paintings (L-R): The Ramble and Finishing Touches have been accepted into the Salmagundi Club Fall Auction cycle. There will be a silent auction on Sept 30th, from 6-9 PM, which is also the reception. Then on three dates: Oct 7th (8PM), 16th (2PM), &21st (8PM) there will be live auctions for all the artwork. This event is a lot of fun, there are complimentary refreshments, and you could potentially walk home with an original work of art! For the first time on exhibit! Arrival in God's Land, my epic-scale Ancient Egyptian History painting depicting the expedition to Punt during the reign of Queen Hatchepsut, 1473-1458 BCE. Don't miss it! Venetian Vendor (image on right) won a certificate of merit at the 2016 Salmagundi Club Urban Romance Exhibition. I also have Athenian Drifter in the show. Come see this spectacular exhibit that I'm proud to be a part of. Runs until June 3rd. Open to the public/Free Admission. 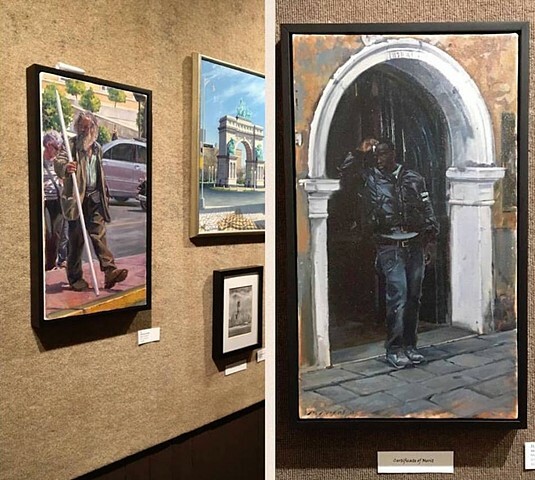 I'm pleased to announce that my paintings Athenian Drifter and Venetian Vendor were selected for the Salmagundi Club Annual Urban Romance Exhibition. The show runs from May 23rd-June 3rd. 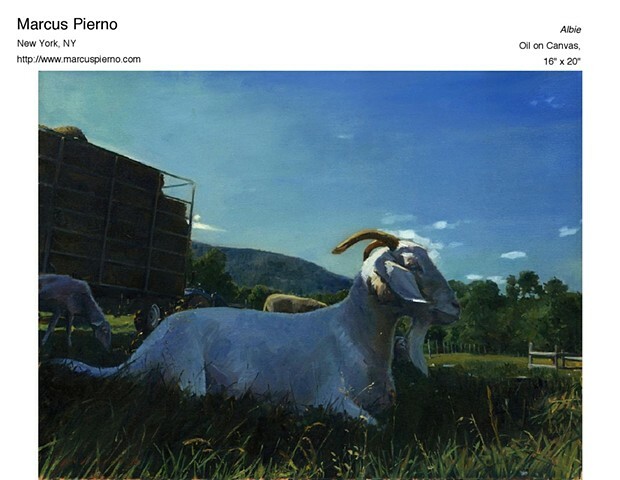 Reception is Weds, May 25th, 6-8PM. 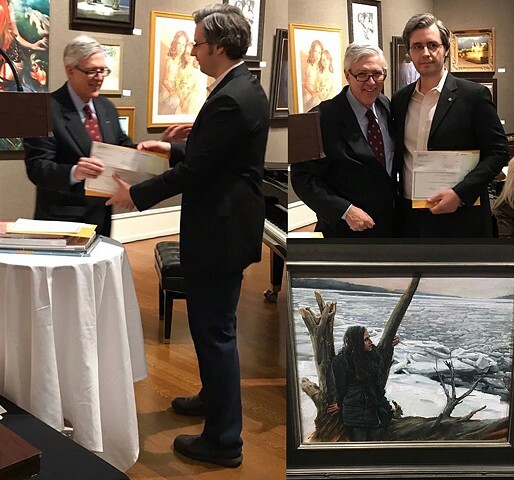 Last night at The Salmagundi Club 132nd Annual Member's Show, The Ramble won the Arthur T. Hill Memorial Award for Landscape by an artist under 45 years of age. Here I am receiving the award. 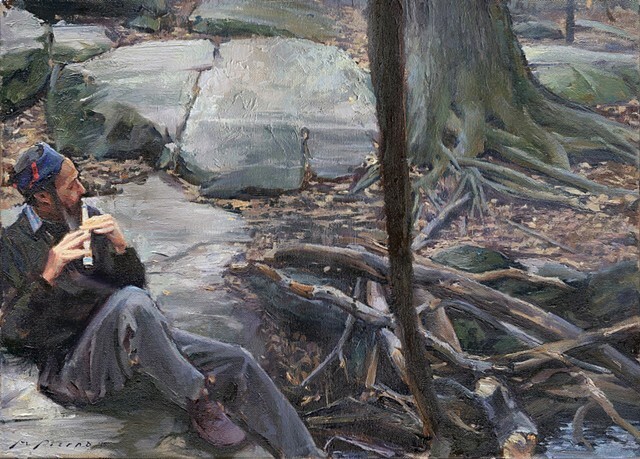 My painting "The Ramble" was accepted to the Salmagundi Club Annual Members' Show. The exhibition will run from April 25th to May 19th. Gallery hours are M-F, 1-6pm; Sat and Sun, 1-5pm. Reception & Awards: Weds May 4th, 6-8pm. Free Admission. I am very pleased to announce that it's official! I've been accepted to the Salmagundi Club. I received the new membership packet last night. I had applied back in December, but the application process takes a few months, and I've been on the edge of my seat the whole time. This is something I've wanted to do for a while. For those of you who are not familiar, the Salmagundi Club is a visual arts society that has been around since 1871. They regularly hold public exhibitions of works by its members. Located in a gorgeous building on 12th St and 5th Ave, it's also a museum and library with an outstanding permanent collection. Its membership has included some of my all-time favorite artists; names like Howard Pyle, William Merritt Chase, Louis Comfort Tiffany, and J. Alden Weir amongst many others. Even my uncle George Walsh apparently exhibited there, even though he was never an official member. So hopefully this is the start of something great. I'm excited! A canvas print of my painting Kayli II from The Sanctuary Animals Series is going to be part of the VeggieWorld expo in Paris on April 2-3. Here it is (middle row, 2nd from left) amongst some other reproductions of works from the Art of Compassion project ready to be installed. Proud and excited to be a part of this! Even though I cannot attend in person, I'll definitely be there in spirit. 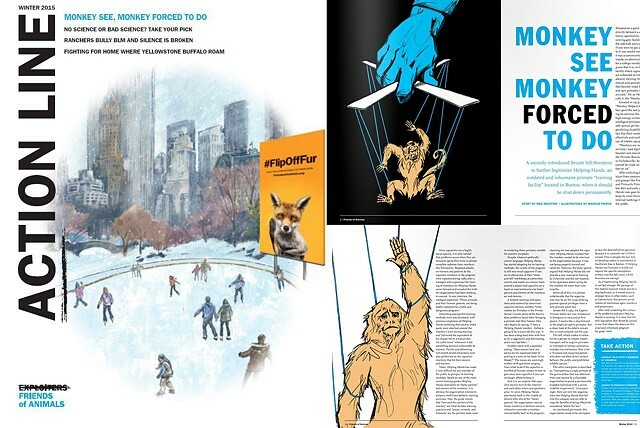 If you would like to receive this magazine in print along with many other excellent benefits, but above all, support the important work Friends of Animals does, please consider becoming a member today. Your membership will play a major role in helping animals, saving the environment, and creating a better and more compassionate world. Thank You! 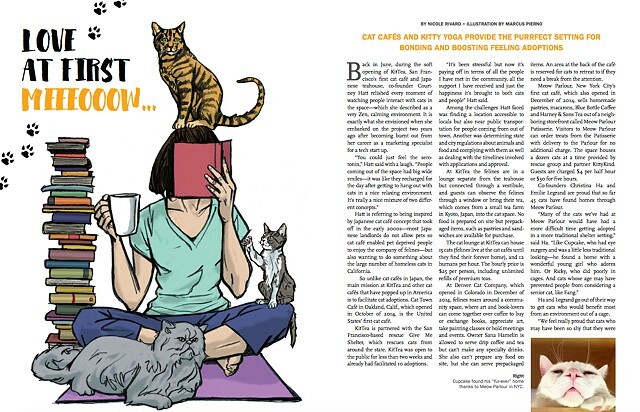 If you would like to receive this magazine along with many other excellent benefits, but above all, support the important work Friends of Animals does, please consider becoming a member today. Your membership will play a major role in helping animals, saving the environment, and creating a better and more compassionate world. Thank You. I just returned from a rally with Friends of Animals and other animal activist groups at City Hall in NYC in support the passage of a bill introduced by Senator Tony Avella that would help put an end to trophy hunting in Africa and prohibit possession, importation, sale and transportation of the "Big Five African Species" (African elephant, lion, leopard, white rhino and black rhino) in New York. 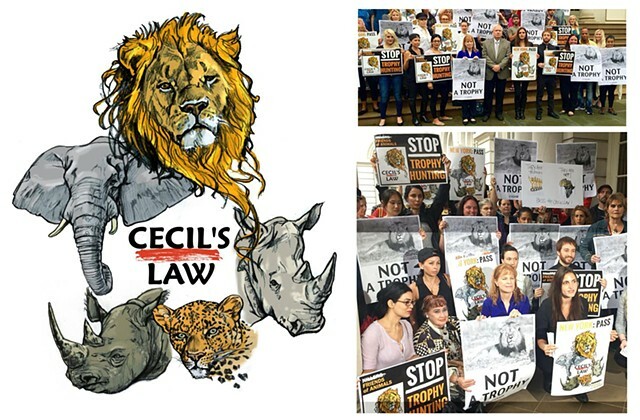 In light of recent events, the bill has been named "Cecil's Law" after the lion who was killed in Zimbabwe by Walter Palmer. Friends of Animals commissioned me to illustrate the poster for this rally and campaign. 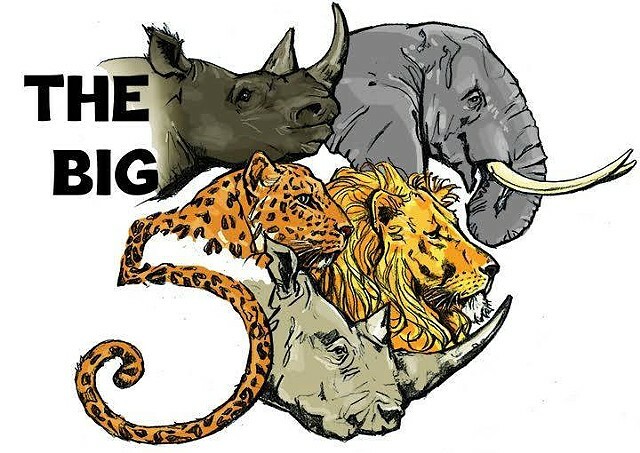 It's a variation of my recent African Big Five illustration that was done for Action Line Magazine. This time however, Cecil's likeness is featured in the group. Earlier today, Friends of Animals along with other animal rights activists converged on Billings, MT to protest the BLM's (Bureau of Land Management) proposed roundup of a local wild horse population to administer PZP (Porcine Zona Pellucida-a wildlife contraceptive) through the form of a dart gun, which would surely inflict death and a multitude of other devastating effects on the well-being on the herd. This type of recourse however is entirely consistent with the violent and inhumane way in which the BLM normally treats wild horse populations. So Friends of Animals was there today to say enough is enough, and to urge the BLM to leave the wild horses alone. I was commissioned by Friends of Animals to illustrate one of the banners that was used today at the protest outside the BLM Montana-Dakotas office. 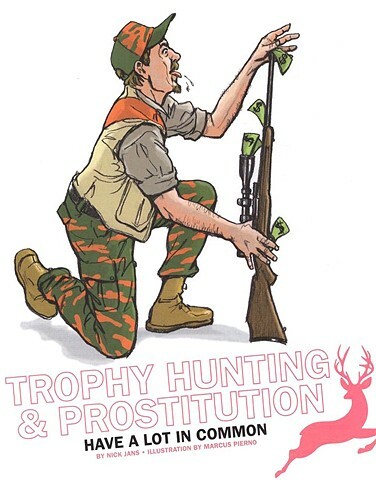 It was a visualization of a concept that they devised, showing Jay Kirkpatrick (champion of PZP) "in bed" with a member of the BLM and passing over a dart gun. Meanwhile Ginger Kathrens of the Cloud Foundation draws their attention to a wild horse. This was done in my comic/social commentary style of illustration. 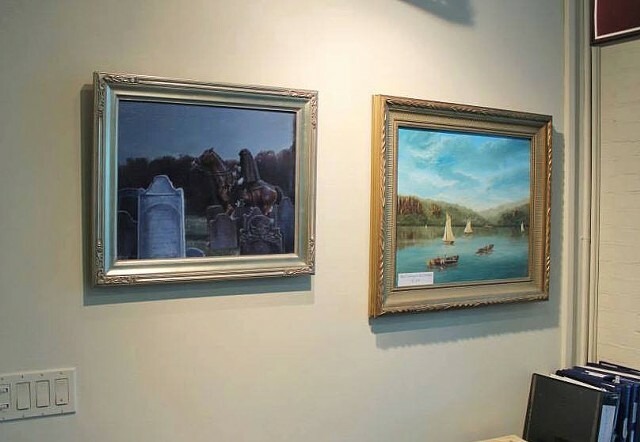 My three latest Legend of Sleepy Hollow paintings have recently been installed at the visitors center at both Washington Irving's Sunnyside house and the Philipsburg Manor Museum. 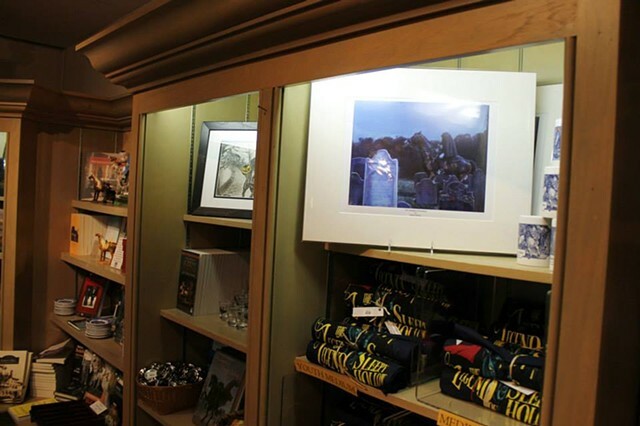 You'll find "In Nightly Quest" at Sunnyside, and "The Flight of Ichabod Crane" and "Unrested" at Philipsburg (as of this morning "The Flight of Ichabod Crane original painting has sold!). Matted prints of each painting are also for sale at each location. 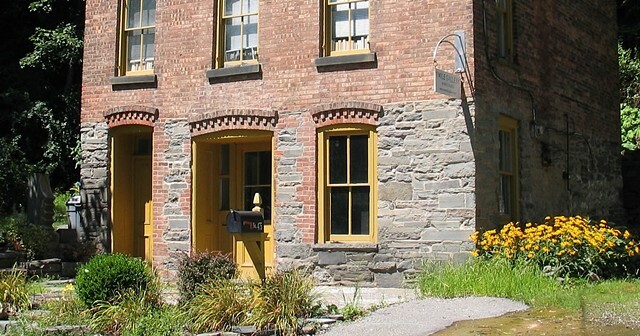 Tours of both Sunnyside and Philipsburg Manor, as well as several other historic sites are available throughout the rest of the year and offer the visitor a veritable journey into the past that is not to be missed. Both locations are a short car, bus, or train ride from practically anywhere in the New York metro area. So come see the work, check out the spectacular gift shops, and experience some of the most beautiful and fascinating historic places to be found anywhere. I am very excited to officially announce that I am going to be part of an upcoming book about animal activism through art. 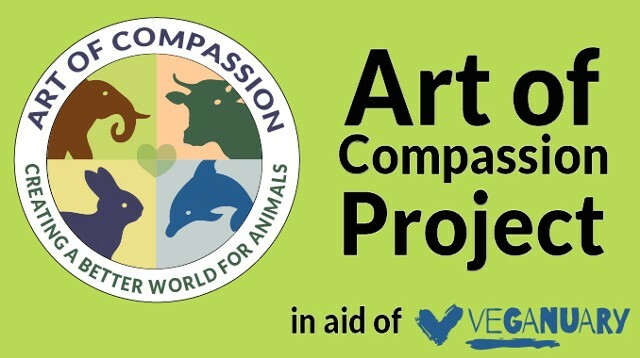 The book will feature 78 artists from around the world whose work focuses on animal rights issues. All proceeds from the book will benefit Veganuary, a veganism advocacy organization. 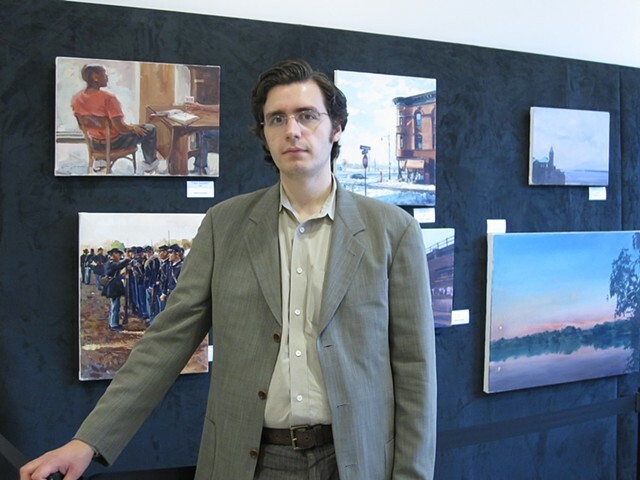 Five of my paintings are in the Spring Grand Salon Show at Greenpoint Gallery. 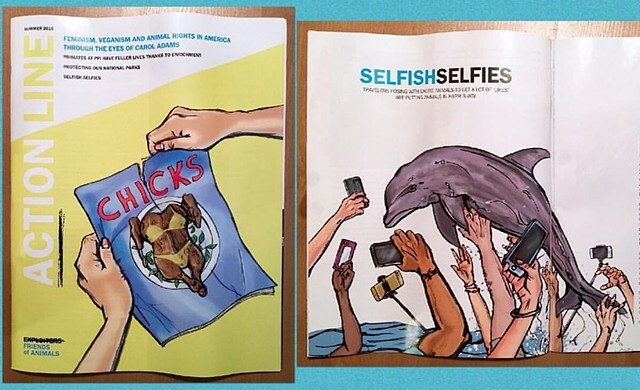 The Spring issue of Friends of Animals' Action Line Magazine is now available online! 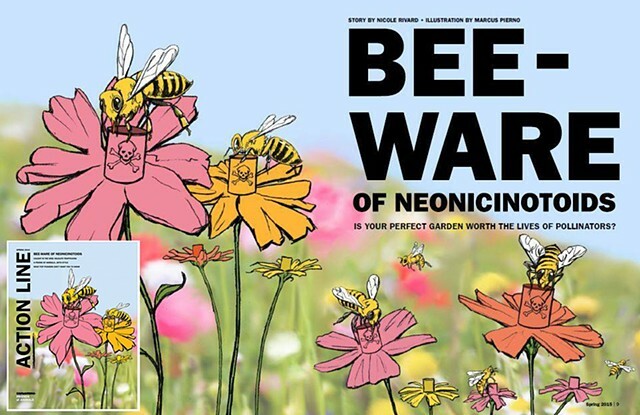 I illustrated the cover story which addresses the dangers of pesticides on the bee population and its other detrimental effects to the environment, and what you can do to help make a change. Check out the Spring issue of Action Line and consider becoming a member of Friends of Animals today! 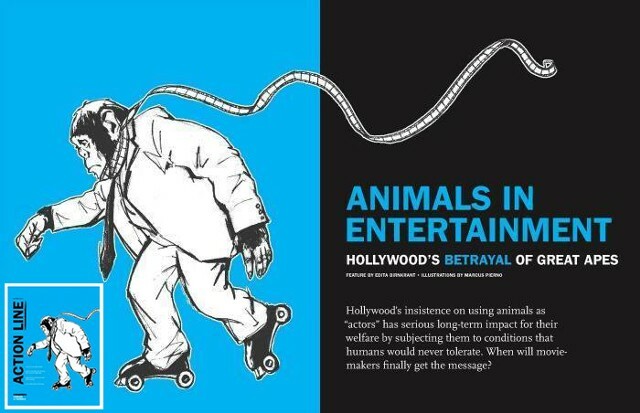 Here's the latest issue of Action Line Magazine from Friends of Animals. I illustrated the cover, which represents FoA's FlipOffFur campaign. The actual billboard currently sits near Times Square, but we wanted to show how strongly its message has successfully reached people in the epicenter of the holiday season. Furthermore, how it has effectively done much to change the atmosphere by urging people to stop and think about fur. This was painted in a traditional fashion with gouache watercolors, almost mimicking the look of a benign, classic New Yorker Magazine cover-but with a thought-provoking twist! I also illustrated the feature article, which examines the exploitation of capuchin monkeys as "service animals" and what you can do to change the legislation that allows this to happen. It's that time of year again (Halloween season), which means that among many other exciting things, my painting "The Headless Horseman" is back on view at the Philipsburg Manor Museum Gift Shop, along with 11x14 matted open edition prints of the painting that are also for sale. Prints will also be available for purchase at Sunnyside, the home of Washington Irving. 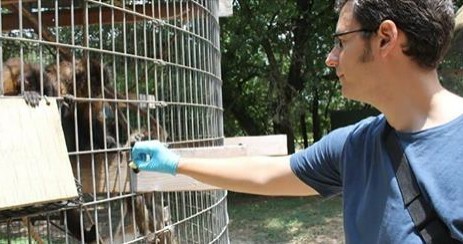 Article about my recent visit to the Primarily Primates sanctuary in San Antonio, TX. Read about my experiences and please consider donating to the sanctuary and/or volunteering if you are in the area. Thanks! 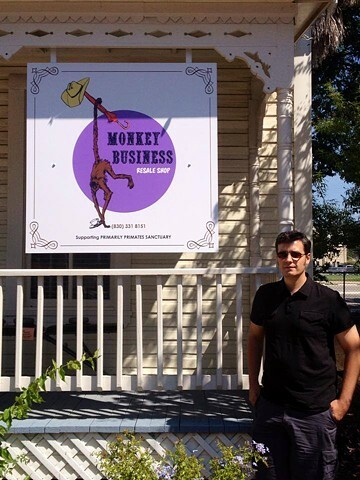 The logo for Monkey Business Resale Shop that I illustrated and helped design has just been installed. Be sure to visit if you're in the area. All sales support Primarily Primates Animal Sanctuary in San Antonio, TX. The show last night was a big success! Many thanks to everyone who stopped by. 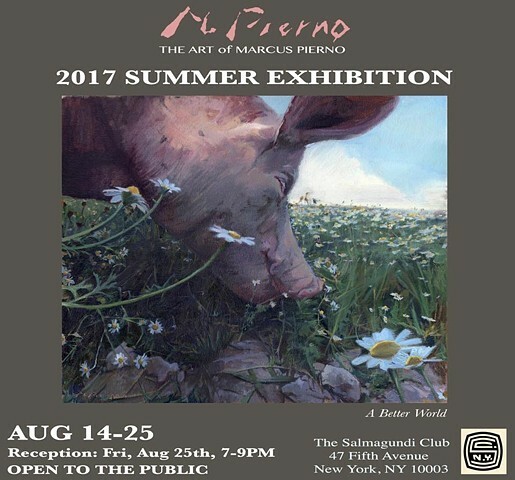 Opening night art show exhibiting original drawings and oil paintings of sanctuary animals by Marcus Pierno at Cafe Blossom on Carmine. The art show will run through the summer. 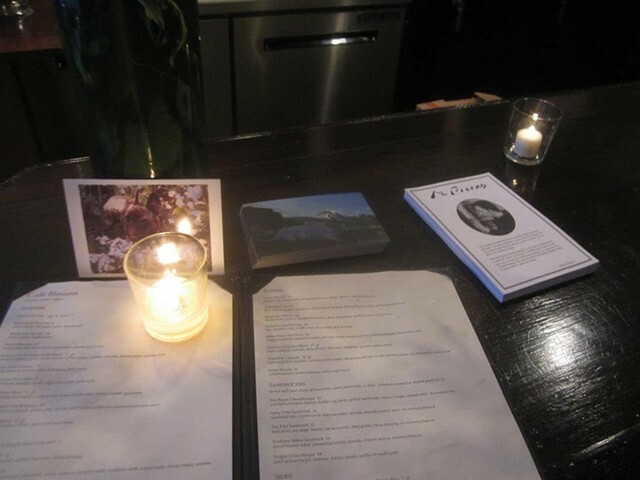 Come enjoy the art and amazing vegan cuisine. For all of those who'd like to sit at our reserved table, please let me know. It's free to attend the exhibit, but not to eat dinner. For those who can't make the reserved dinner from 6pm-7pm, Blossom will be open for dinner regular hours, closing at 10pm. Look forward to seeing you there!!! The online version of the Summer issue of Action Line Magazine is available now. I illustrated this excellent article titled "Leave Wild Horses Untouched". 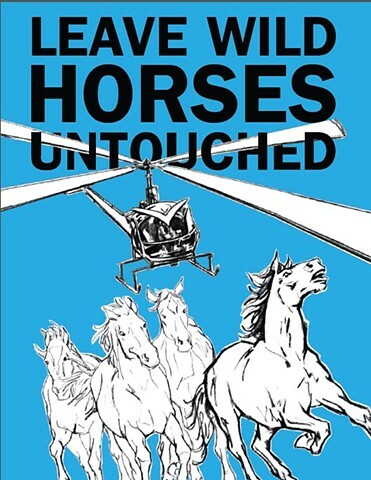 It examines how wild horses have suffered for decades at the hands of the BLM (Bureau of Land Management), yet also discusses the cruel exploitation of these majestic animals in a broader historical context. This eye-opening investigation shows us how the very existence of wild horses is now under threat because of the BLM, and the important step Friends of Animals has taken, and what you can do, towards ensuring their protection in the future. Check it out and please consider supporting the important work of Friends of Animals by becoming a member today. The Spring 2014 issue of Action Line Magazine published by Friends of Animals arrived today. 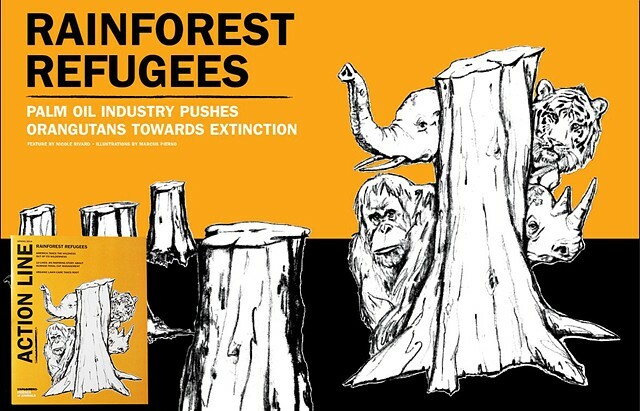 I illustrated the cover story-an excellent article about the rainforest destruction inflicted by the palm oil industry, its constant threat to orangutans and other wildlife, and what you can do to boycott this deadly ingredient found in many products. 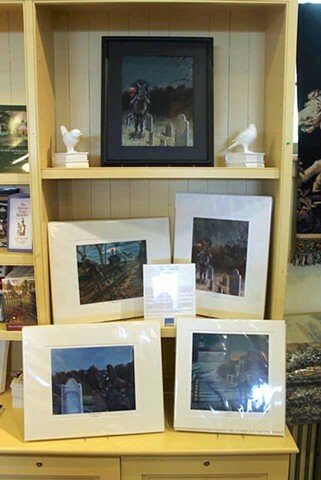 My painting "The Headless Horseman" is now on view and for sale at the Philipsburg Manor Museum Gift Shop, along with matted 11x14 open edition prints of the painting. Prints will also be available for purchase at Sunnyside, the home of Washington Irving. One-man show featuring my landscapes and urban subjects. 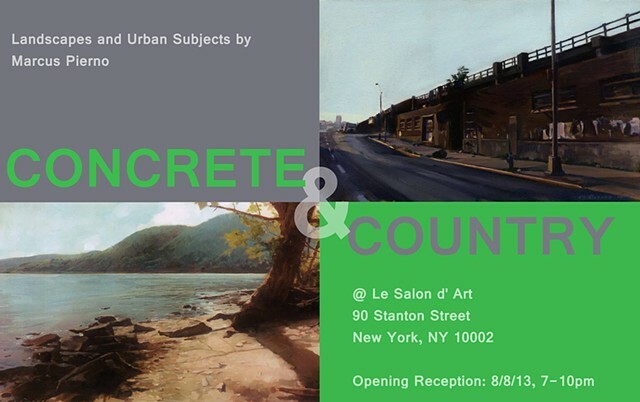 Opening Reception: August 8, 2013. Show will run to September 5. Cafe Blossom will be showing 8-10 of my original paintings. The show opens Tuesday Feb 5th, and runs through April. Please stop by to see the art and try the amazing vegan cuisine! I finally got around to starting a fanpage on Facebook. Please follow the link below to check it out, and don't forget to hit the "Like" button! 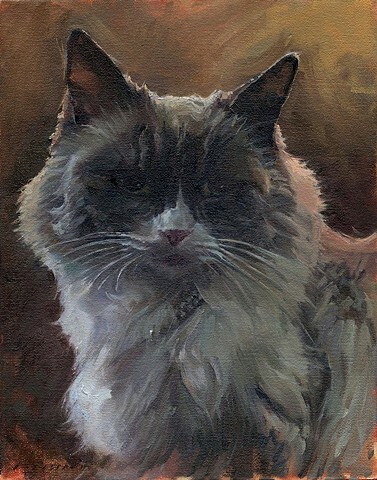 My painting "Albie" from the Sanctuary Animals Series, was selected as an honorable mention in the Cover 7 Contest, an international open themed contest for the cover of Artist Portfolio Magazine #7. "Albie" is featured in the magazine on page 14. My work has been selected for a melancholy-themed special exhibition from Projekt30. Great Food, Great People! Offering a variety of sweet and savory organic foods. "Vegan. Vibrant. Vegetarian. Honoring Mother Earth since 1978"
My work is now on view in the gallery space at the newly rennovated Central Islip Public Library. There are 16 oil paintings altogether, and the exhibit will run for at least the next month. 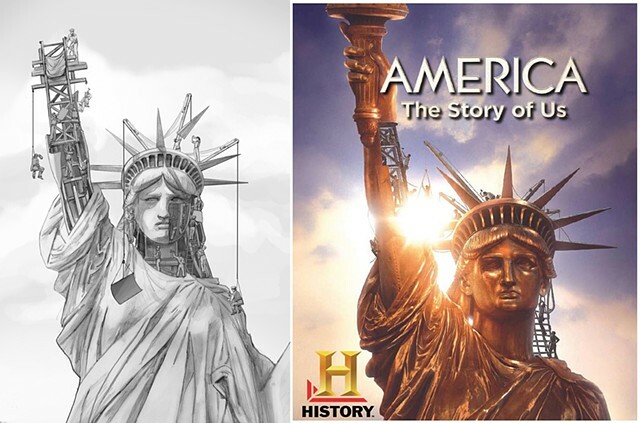 I worked on the preliminary art for the Statue of Liberty construction sequences in this upcoming 12-part miniseries from producer/director Jane Root. Watch it this spring on the History Channel.